January 29, 2016 Robert W.
Large step repeat banners are a marketing idea created by special events and night clubs to capture a background image that can be photographed with people standing in front of them. When pictures are taken against large step repeat banners, those images will bring back fond memories of the good times at that event. With the pictures, text and logos in the background, you will always be able to see them and this creates a great marketing idea for those who have their names on the large step repeat banners. Large step repeat banners are vinyl banners that have a logo, picture or name on it that is printed over and over again ( step and repeat) so that it is viewable from different angles. Many times sponsors of an event will have their names on the banner or in the case of the Oscars, just the name Oscars and a statue is all that is needed. These pictures are then taken and posted in various publications so that they can be seen by many people. The advertisers or sponsors then get name recognition off the pictures and hopefully, people will use their product or service. Large step repeat banners are printed on a vinyl banner material that is matte. The printers use matte so that there is no reflection of light or flash so the picture will not be ruined. Many times people will mistakenly do a background step and repeat banner in gloss, only to find out the reflecting light on the gloss material ruined the picture. Large step repeat banners can be made in a variety of sizes to accommodate the particular event. For example, maybe a 100ft long step and repeat banner is needed for the ” Oscars” because there are so many participants. While a simple 8ft x 8ft step repeat banner is sufficient for a night club. Las Vegas Custom Car Magnets For Advertising. January 28, 2016 Robert W.
Las Vegas custom car magnets are a great idea for the small businessman who wants to get his company name and information out in publics view. These noticeable and cost effective magnets attach to the doors of your vehicle and can be removed very quickly and turn your car into a family car in seconds. Yet when applied to your vehicle’s doors, they grab the attention of other motorists around you. Las Vegas custom car magnets are not expensive. 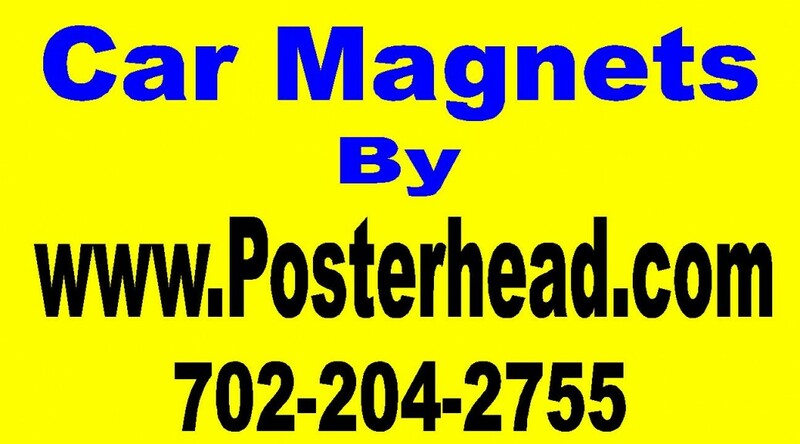 A pair of 12″ x 18″ car magnets will cost around $30.00 in Las Vegas. These removable car magnets are in full color ( as many colors as you want on the magnets) and can also have your picture and logo printed on them as well. Best of all, they can be safely removed and put on without causing any damage to your vehicle’s paint. Simply adding the car magnet to your vehicles door allows for exposure to your business and removal makes your vehicle anonymous ( which is good if you are in the dating scene). Many other size custom car magnets are available. Las Vegas custom car magnets are printed directly on the magnet or printed on vinyl and then applied to the magnet. Since the car magnet will be outdoors, eco solvent or latex inks are used in the printing process to guard against color fading. These magnets are made with 30 mil sheeting and under normal conditions will not come off the vehicle. It is important to not adhere your magnet over a car side mo9lding or other object where air can get between the magnet and the cars body. This air gap will cause the magnet to fly off the vehicle as air pressure intensifies at the higher speeds. Las Vegas custom car magnets are available at your local sign shop in Southern Nevada and will most certainly get your business noticed. Custom Online Banner Design In Las Vegas. January 27, 2016 Robert W.
Custom online banner design in Las Vegas is now possible through some of the more elite sign shops in Las Vegas. Custom online banner design allows for you to custom make through a professional design program, your own vinyl banner design that will satisfy you. You are in control of the design and you get to make sure you get exactly what you want. Custom online banner design in Las Vegas allows for you to make full color banners with your own logos and pictures using state of the art professional design programs. These design programs allow you to upload your pictures and artwork so that you can truly create your own banner. These banners are then paid for and picked up in the Las Vegas area located adjacent to the freeway for easy pick up. This is a professional design program with many features that will get you a professional looking design at no additional cost. Why go back and forth on a design when you can just design the banner yourself and save all the aggravation. Once you finish designing your custom banner online, simply pay for it online and then pick it up in Las Vegas a few days later. Your custom banner design in Las Vegas will be printed on a 13 ounce banner material with eco solvent inks ( for long lasting and vivid colors) and is designed for indoor and outdoor usage. The eco solvent ink will not fade in the hot Las Vegas sun for 3 years. The custom online banner will be hemmed ( for greater strength at the perimeter) and then grommeted every 2 feet or so in order to make it easy to install. Custom online banner design in Las Vegas is now a reality and can be found at select sign shops in the local area. Spring Valley Nevada mesh banners are used for windy days and for times when the only opportunity to hang a banner is between to poles or trees with rope. While this type of hanging between two trees or poles is not the preferred method, sometimes that is all that is available. What is a mesh banner ? A mesh banner is a lightweight vinyl banner that has holes in it so that air can pas through these holes so that when the banner is hung, wind will not force the banner to be torn or ripped as in a conventional banner. The mesh banner is usually a 10 ounce banner material ( but the weight of the material can vary) and can be printed on with state of the art inks for long lasting use in the outdoors. While these Spring Valley Nevada mesh banners do not have the clarity of a full vinyl banner, they offer the ability to be used in ways that a conventional banner cannot be hung without being damaged. Mesh banners are the preferred banner to be used when you have windy or snowy days. Spring Valley Nevada mesh banners are about $3.50 a square foot and are printed in full color. They are usually reinforced at the edge through a process known as hemming and come with grommets strategically placed every 2 feet or so in order they can easily be hung. Many times construction companies will use mesh banners to line a construction site around the perimeter so that they get advertising exposure. They are attached to chain link fences with simple zip ties. Spring Valley Nevada mesh banners can be purchased online or at local sign shops in the Las Vegas area at very affordable rates. Simply contact a local sign shop to assist you in obtaining your mesh banner. January 24, 2016 Robert W.
Las Vegas wholesale poster banners offer a business an opportunity to place large poster banners on their premises to be seen by the thousands of people who pass by there store monthly. When strategically placed on a business property, they can be seen by the thousands of vehicles that drive on the streets of Las Vegas everyday. Las Vegas wholesale poster banners can be made in a variety of sizes to accommodate the space limitations. Of course, the old saying ” the bigger the better” is applicable here because you want to make sure that your Las Vegas wholesale poster banners can be seen from far away and leave an impression on your clients. In fact, several companies that have businesses adjacent to the Las Vegas freeways are taking advantage of their location by placing large vinyl banners ( 10ft x 25ft or bigger) on their buildings so that they get exposure to all the cars and trucks that use the freeways everyday. These large banners act as a billboard but without the monthly rental fees. Las Vegas wholesale poster banners are being offered at select sign shops in the Las Vegas area. Take advantage of this great and economical way to get your business to stand out among its competition. January 23, 2016 Robert W.
Window vision or window perf is being used by businesses all over the Las Vegas area. Window vision or window perf is known by many names such as see through graphics, one way graphics, etc. but they all do the same job. They allow for a business to use there storefront windows as advertising while still maintaining the ability to use the windows to see out of. Many businesses are limited on their signage by government regulations and signage capacity. Windows are generally considered a free area to advertise on without any special permit being required. Consequently, businesses are taking advantage of this loophole by advertising on them. Some of the best examples of this window usage is by the fast food chains, McDonalds and Burger King. You will notice these fast food restaurants utilize their windows to promote new products and the sales of products and the window dressings are regularly changed out so the advertising message does not become stale. However, while inside the store, they still allow the customer to see outside. Window vision or window perf is a vinyl material with a 60/40 or 70/30 split that is material and holes in it that allows for you to print your advertising message on it but still be able to see through it. The people on the outside can only see your marketing message while the people on the inside cannot. Window vision or window perf is a non permanent material that easily applies to a window and can be removed with no special tools. 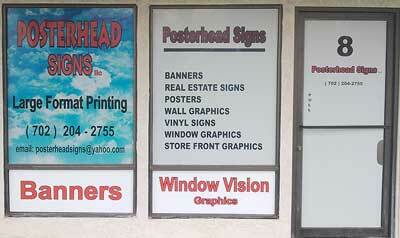 The window vision or window perf cost around $3.50 a sq ft., which includes your custom design being printed on it. Window vision or window perf can be found at your local sign shop in Las Vegas or online through a Google or Yahoo engine search. Discount vertical banners are being used at Las Vegas conventions and shows more than ever before. With online competition, prices for discount vertical banners are more competitive than ever before. That completion is even greater in the Las Vegas area. More exhibitions, trade shows and conventions are held in Southern Nevada than any other place in the United States. The weather is great year round and there is so much to do in Las Vegas that everybody wants to come here for their business shows. Consequently, Las Vegas boasts a extra large sign industry that caters not only to businesses and casinos , but also to the large convention industry. Discount vertical banners are very popular with this crowd as they are very easy to install and set up. They are very cost effective and offer a great graphic display. By placing vertical upright banners next to each other, they can appear to be a solid graphic that makes the graphic appear much larger. Discount vertical banners are inexpensive. A retractable banner stand that is 33″ x 78″ with an adjustable pole and carrying bag cost less than $100.00. There are many different sizes of retractable banner stands that are offered at various prices. If a lower priced vertical banner is needed, the x stand banner stand is a very viable option. The 24″ x 63″ X Stand sells for under $50.00 and offers a easy replacement of banner if you want to change out the graphic. The You Tube video, https://www.youtube.com/watch?v=OkjZ9glitnU offers a glimpse of a video displaying this graphic. The cousin to this X Stand vertical banner, the 31″ 2″ x 71″ costs under $60.00 and can also have the banner graphic changed out easily. Discount vertical banners are available at sign shops in the Las Vegas area that offer wholesale signs and banners. Look online for a wholesale sign shop near you to assist you with your vertical banners. January 20, 2016 Robert W.
Spring Valley Nevada large banners are being used by businesses that want to get noticed in the Spring Valley area of Las Vegas. These large vinyl banners are being placed on the business premises and can be seen from far away. Las Vegas businesses are learning that they are in hard economic times and that they need to adjust there marketing strategy to these rough times. The old days of taking out a newspaper ad and expecting customers to flock to your store are long gone. People do not have the money they use to and businesses need to adapt. Smart businesses are learning that the population in Las Vegas continues to grow at a brisk pace and that by placing signs on their business premises, they can reach out and communicate with their customers and potential customers. For example, a dry cleaning store in Las Vegas uses large banners to market what dry cleaning special they are currently running. Instead of placing ads in mailer coupons and spending hundreds of dollars to advertise to residents within a mile of their store, they are using large banners at a fraction of that price to notify customers of what specials they have going on. Since within a two week period, many residents will naturally at one point or another pass their store, it seems to be a more logical and cost effective way to reach out to neighborhood customers. Spring Valley Nevada large banners are not expensive and a very cost effective way to market your business. At around $2.00 a square foot for a full color banner, Spring Valley Nevada large banners make economic sense. These banners can be found at local sign shops in the Spring Valley area or at websites like www.LasVegasLargeBanners.com . 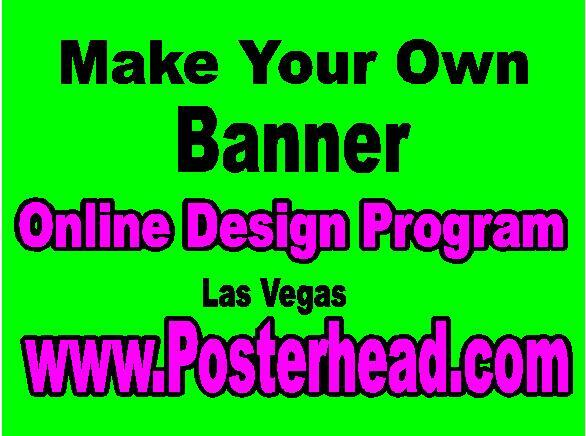 In fact, many sign companies in LAs Vegas have their own online design programs to allow the consumer to design their own banner. January 18, 2016 Robert W.
Spring Valley Nevada banner printing allows for discount vinyl banners be printed to help businesses gain market share and keep the market share they currently have. In todays tough economic times, businesses need to think outside the box and find a way to drive business and Spring Valley Nevada banner printing allows for that. Spring Valley Nevada banner printing starts with state of the art inks like eco solvent and latex inks that are printed with large format printers onto a 13 ounce banner vinyl banner material. These banners are then grommeted for easy installation. The average cost for these banners is around $2.00 a square foot in full color. Many sign shops in Las Vegas offer discounts on banner printing on certain sizes. Currently, the 3ft x 8ft banner is being offered for $39.00 in Las Vegas as shown in this You Tube video https://www.youtube.com/watch?v=iPARROEG90c . Smart Spring Valley businesses are using these vinyl banners as a form of low cost advertising. These Spring Valley businesses are placing banners that advertise their products on their premises so they can be seen by the thousands of people that traverse by their location on a weekly basis. Instead of spending hundreds, if not thousands of dollars on print advertising like newspaper ads or direct mail ads, the businesses are using these banners that cost far less and bringing great results. One mechanic shop in Las Vegas always rotates his banners on a weekly basis offering a mechanic service special. By rotating his automotive banners , he appeals to many consumers for his many different services. One week will be oil change specials, the next week he will be offering windshield wiper replacement. The key is that he always offers new products and services. Spring Valley banner printing can be found by sign shops within the Spring Valley area. Vertical Retractable Banner Stands For Conventions. January 17, 2016 Robert W.
Vertical retractable banner stands are very popular for Las Vegas conventions and trade shows. They are easy to set up and very portable enabling them to be a very convenient graphic display. More conventions are held in Las Vegas than any other place in the United States. Las Vegas is very popular because there is so many things to do in Las Vegas besides the conventions and trade shows. There is year round good weather that allows golf, boating, winter skiing at nearby Mt. Charleston along with all the fun that the casinos offer such as gambling, shows, entertainments, etc. Consequently, many casinos are held in Las Vegas and very elaborate booth graphic displays are used by the big corporations. If you are not a big fortune 500 company, medium to smaller companies use these vertical retractable banner stands as props for their convention booths. These vertical retractable banner stands are very popular and very inexpensive and many times can be purchased at a discount. The most popular vertical retractable banner stands is the 33″ x 78″ retractable banner stand that can be purchased for under $100.00. Many people prefer the adjustable retractable banner stands with the adjustable pole rather than the fixed pole system that allows no room for error and the graphic must be exactly one size versus the adjustable pole system that allows play in the height of the banner graphic. The vertical retractable banner stands come in a variety of widths and height. When put together, the banner stands look like one very large graphic. In addition, x stand vertical banner stands are a cheaper version of the retractable banner stand and can also be used as vertical graphics. These x stand vertical banners come in a 24″ x 63″ size and a 32″ x 71″ size. Vertical retractable banner stands are available at Las Vegas signs shops.